Have you Always Dreamed of a Mountain Getaway? Are you searching for a place where you can escape the hustle and bustle of the city and relax? A place where you can see the stars at night, enjoy nature, and partake in a plethora of extreme sports activities? A place where your back door opens to a majestic landscape of beautiful mountains where you can explore and play? If this is your situation then our Grand Park community is a great choice for you! 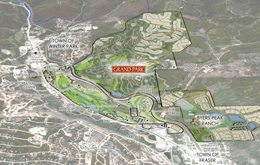 Set in the heart of the beautiful Rocky Mountains, just at the edge of Winter Park, Grand Park is the ideal place to find your dream mountain home. Just over an hour outside of Denver, Winter Park is a picturesque town well known for skiing in the winter and mountain biking in the summer. Our small mountain community of Winter Park real estate is friendly, easy to get to, and far more affordable than many other ski towns in Colorado. If you are looking to experience true Colorado mountain living for a reasonable price, then Winter Park just might be the place for you! Grand Park is much more than just Real Estate in Winter Park. We are building a large, new mountain community with beautiful new homes and businesses for you to be a part of. Our homes in Grand Park all feature high-end finishes and Built Green™ values, making them extremely energy efficient and comfortable. We believe in building homes that last and all of our Winter Park Colorado Real Estate is built with an eye for quality. Whether you are looking to relocate, retire to the mountains full time, or just looking for a second home to get away from it all, Grand Park is a great, affordable option for your Colorado vacation home. If you have any questions about Winter Park Colorado Real Estate, please don't hesitate to contact our helpful staff today! It's no secret that Colorado is slowly becoming on one the most attractive places to live in the country. There are many reasons why everyone is moving to Colorado, but the fact of the matter is that this state is experiencing growth at a rate that nobody expected! In Denver, rents continue to rise and property value is at an all-time high. The future looks bright for our state and with this trend set to continue, it's a great time to purchase property in Colorado. While many investors look to Denver to buy a home, mountain towns near ski resorts are another very popular place for an investment property. At this time, Winter Park is still not hot on the radar of people looking to purchase a mountain property in Colorado, being overshadowed by the extraordinarily high-priced destinations of places like Aspen, Vail, or Breckenridge. It is for this reason we are able to offer Winter Park investment property for starting as low as $359,000! However, with Winter Park's close proximity to Denver, beautiful location, and the popularity of Winter Park ski resort, it's an inevitability that this area is going to follow stride with the rest of Colorado to become a very popular place to live.